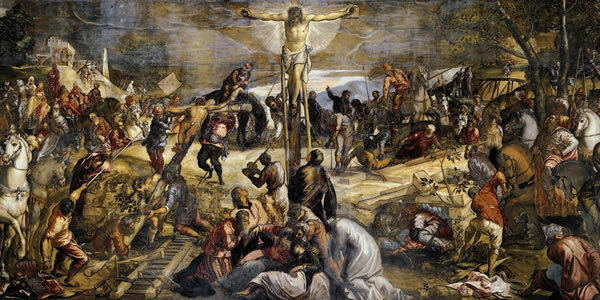 Jacopo Tintoretto's Crucifixion (1565) in the Scuola Grande di San Rocco. A scuola was a lay fraternity whose members dedicated their time and money to a charitable cause. It was also a venue for these private gentleman's clubs to show off, and to that end many scuole commissioned artists to decorate their home bases. 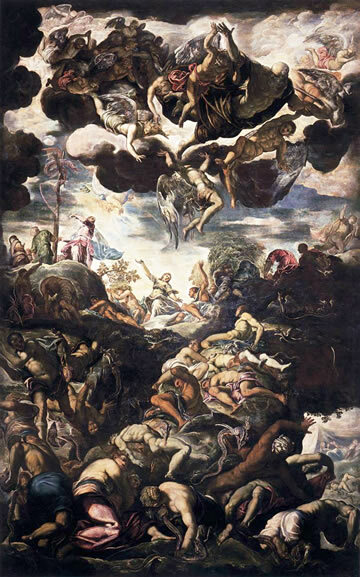 When the Scuola di San Rocco held an artists' competition in 1564, Renaissance master Jacopo Robusti (1518–94)—better known as Tintoretto because because his father was a tintore, a fabric dyer—pulled a fast one on his rivals. 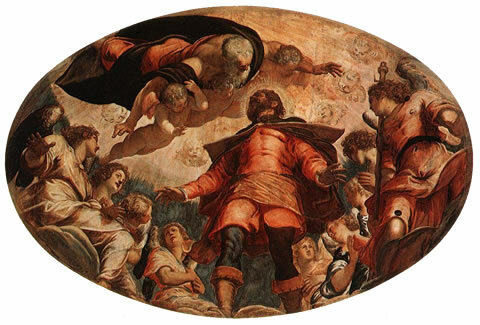 The Glory of St. Roch (1564) by Tintoretto. Instead of preparing a sketch depicting The Glory of St. Roch for the judges like everyone else, he went ahead and finished a painting, secretly installing it in the ceiling of the Sala dell'Albergo off the second-floor hall. The judges were suitably impressed, and Tintoretto got the job (and, the following year, membership in the confraternity). The Brazen Serpent (1575/76) by Tintoretto. Over the next 23 years, Tintoretto filled the scuola's two floors with more than 50 amazing works, the largest collection of Tintorettos anywhere. The Rest on the Flight into Egypt on the ground floor is superb, but his masterpiece hangs in that tiny Sala dell'Albergo, a huge Crocifissione (Crucifixion) that ranks among the greatest and most moving works in the history of Venetian art. Tintoretto was a devout, unworldly man who traveled beyond Venice only once. His epic canvases are filled with phantasmagoric light and mystical spirituality. In the center of the gilt ceiling of the Great Hall, also upstairs, is Il Serpente di Bronzo (The Bronze Snake). 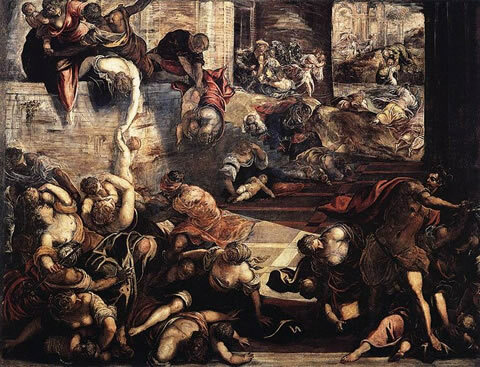 The Massacre of the Innocents (1582/87) by Tintoretto. Among the eight paintings downstairs, each depicting a scene from the New Testament, the most noteworthy is La Strage degli Innocenti (The Slaughter of the Innocents), so full of dramatic urgency and energy the figures seem almost to tumble from the frame. Although dark by nature of the painter's brush, the works were restored in the 1970s. A useful guide to the paintings inside is posted on the wall just before the museum entrance. 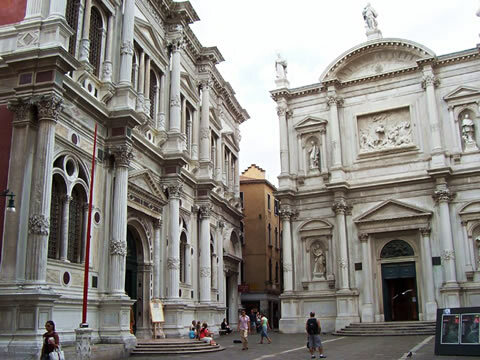 How long does the Scuola Grande di San Rocco take? Planning your day: I guess you could do this in 30 minutes, but I usually spend an hour or more, much of it just sitting along one wall of the Great Hall, staring at the beauty around me: carved stalls, ornate decorations, and all those glorious Tintoretto paintings. The Accademia di San Rocco (tel. +39-041-962-999, www.musicinvenice.com) sponsors highly recommended chamber orchestra concerts in these evocative environs.